So we just lost Amish soulfood chef Chris Scott and I'm MAD. He was gracious and adorable to the end. We still have chef Adrienne Cheatham, Chicago's own Joseph Flamm, mustache Joe Sasto III and Denver's Carrie Baird. Joseph, Sasto III and Carrie chitchat about Oprah Winfrey, Joseph knows Oprah's chef which means they're totally besties. 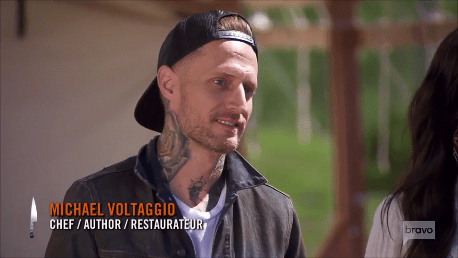 We're off to the first challenge, host Padma Lakshmi introduces us to the Voltaggio brothers. One looks like a criminal three days into a meth binge and the other one is Bryan. Oh. 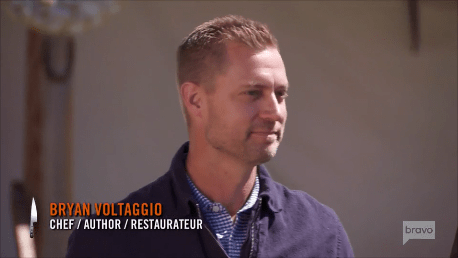 That guy is Michael and he won Top Chef before. My bad. 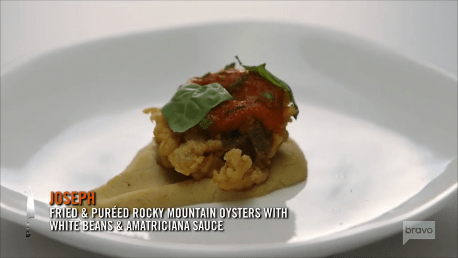 They're making Rocky Mountain Oysters, which are bull testicles. Of course Carrie already did a test batch in preparation, she'll win it with a balls on toast, mark my words. They have 30 minutes to prepare bull testicles TWO ways, um. Joseph calls the flavour a combination of brain and gland, with more iron. WHY WOULD YOU PUT THAT COMBINATION IN YOUR MOUTH? Soooo many puns, Adrienne's got allllll the jokes covered. Carrie's grinding the testicles into pulp. On the bottom is: Joseph Flamm, his nuts were so tough and fried. Carrie's pate was liver-y, so she's also on the bottom. 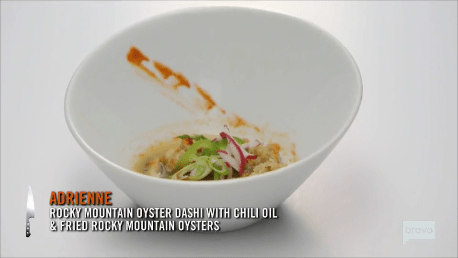 Adrienne's dashi gets lots of kudos but Sasto III's was purty, so he took the win. Go Sasto! This is me being positive! I really thought that was hers. Dangit! A short infomercial for BMW S-5's (WHERE'S MAH CHEQUE??) later and we're off to a wooden Observatory at Alta Lakes where all the family is there! Oh wow, Adrienne's mom surprised me, I guess Adrienne takes after her dad. She's super...blonde. Sasto's dad brought a massive lasagna in a tin tray and all of a sudden I'm back in Jersey Shore and did you know they're coming back for a vacation???? I should not be that excited but there it is. Ooh, Joseph's grandma made rigatoni too, I so want to go to Chicago for Christmas. Awww we getta see the cheftestants as kids and Sasto III was so adorable when little. We knew his mom died when he was a young adult, but watching his dad choke up is a whole other kind of sad. Bob-bless, Sastos. Adrienne was raised in her mom's restaurant, she was so cute. Carrie was quite athletic back in the day, with many many boyfriends. We don't even getta find out how many! This lovely family dinner isn't just so we can cry with Sasto's dad, it's part of the challenge. 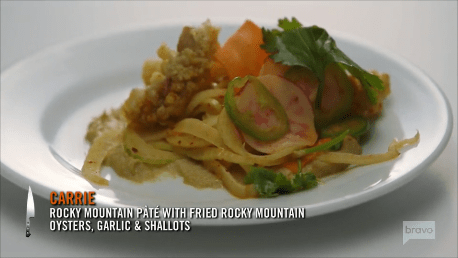 They have to recreate their family's dish and elevate it to show their journey. I wasn't going to make fun of Carrie's beef stroganoff, but it looked super...wet and now we getta see what it looks like on fancy toast. 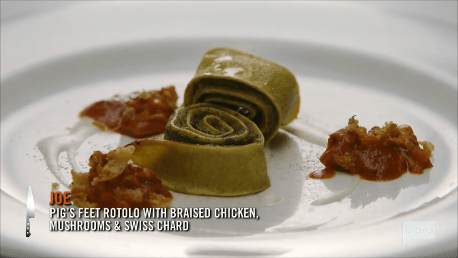 We've got some cooking challenges given the timeline of some of these dishes, but Sasto III gets an extra half hour thanks to his bull testicles. The cheftestants separate off with their support persons, drinking wine and assuring them they're totally gonna win this. I love Joseph's grandma, I want to put her in my pocket. Sasto III has to make his mom's pig feet's gravy? Jaysus. This will be so tough for him. Whole Foods time, Adrienne is working on her mom's gumbo and Carrie is using wild meat in her stroganoff. 11 minutes! 11 MINUTES!! There are 11 minutes!! I am telling you, I would eat at Joseph Flamm's house any time any day. Meatballs are my spirit animals. Sasto III is having a really hard time missing his mom, who passed very quickly from lung cancer. I'm sorry, fella. We're the next day now and Sasto is making use of every second of his extra 30 minutes of prep time. 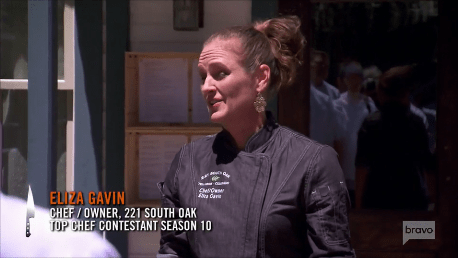 When the other chefs are released to start, they're greeted by former Top Chef contestant Eliza Gavin who owns 221 South Oak where everyone will be cooking today. 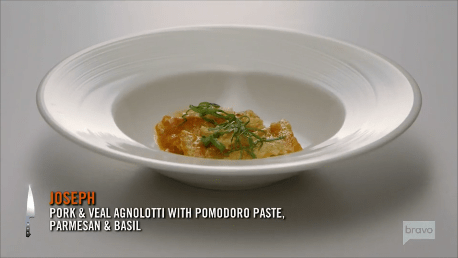 She's super positive and encouraging, basically the opposite of whatever Michael Voltaggio is. 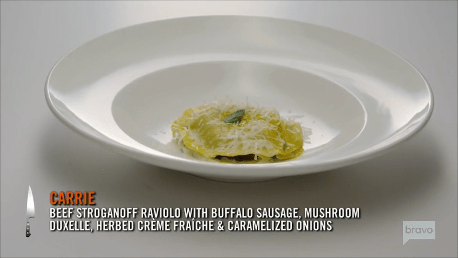 Carrie is really struggling with her pasta dough for her raviola, but we all know she'll pull it out and we'll get some boring winning food. It's time for tasting! Head judge Tom Colicchio joins the family members and Graham Elliot. Sasto III is up first and let's all remember we're not going to hear anything bad at all because the family members have knives and the judges are within reach. Looks so adorable! Duck fat for the roux! I know someone who will be very excited about that. I love how touchy-feely she is with her mom. 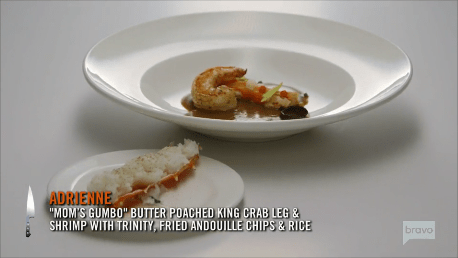 Everyone loved all the dishes because of course they did. The chefs head back to 221 South Oak to do wine bongs because they are all far too young. ADRIENNE WINS!!! Yay!!! I'm so happy, she had that on lock, I am so impressed that she pulled that off because she's got this. But now we have to lose a cheftestant who cooked their very best meal of the season so far. I don't envy the judges today. It comes down to the pasta: Joseph's was under-salted, Sasto III's was cut too soon and Carrie's wasn't stroganoff. And it's Carrie Baird sent to pack her knives. I'd probably be more sad about that if she hadn't cut Tom Colicchio off in the middle of his feedback, thanking him for his feedback that she was clearly not listening to. Ah well, it's an emotional time, that much pressure no doubt brings out the best and worst in people.